“Multi-layered synthetic flooring fused together with a lamination process”. Laminate usually resembles wooden flooring but it can mimic stone. There are many different types of laminate flooring on the market. Laminate is like the chameleon in that it can look like a range of woods such as pine, oak, dark oak, Highland Oak, Beech and many more! 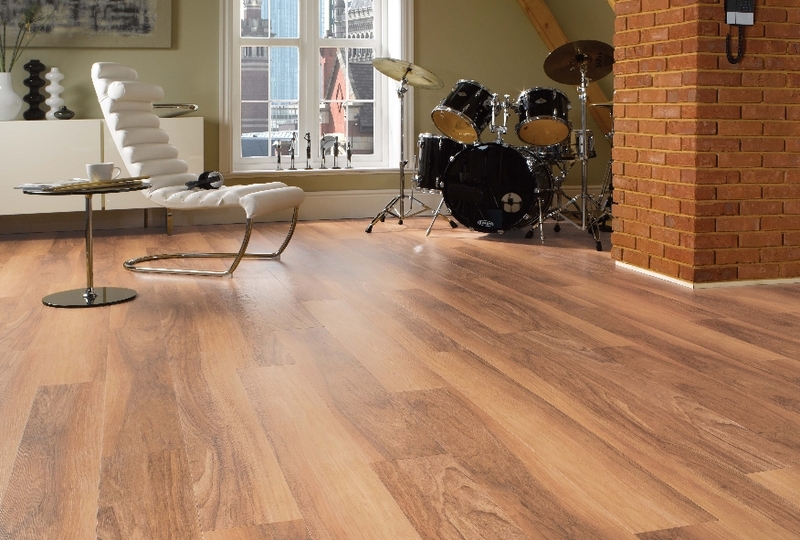 Laminate flooring is relatively easy to install, especially when using the newer laminate flooring which has a click lock design, rather than having to glue separate pieces together. Laminate offers an incredibly durable surface because it hardly ever gets scratched or dented because of its wear layer which is designed to offer protection from high heeled shoes and pet claws! In fact some manufacturers offer a 10 years or more warranty on the wear layer. At Burgess Flooring we can advise you on the manufacturers to choose and how to secure a good warranty on your laminate flooring. 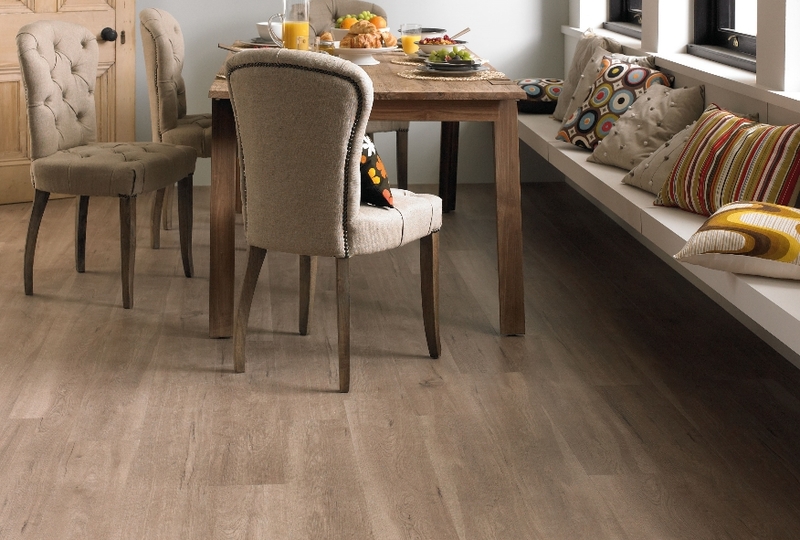 Laminate flooring is fantastic for kitchens, bathrooms and other rooms which see a lot of moisture. Laminate flooring is very easy to clean. It usually only requires a sweep or vacuum and a mop every so often. Laminate doesn’t cling on to dust and dirt like carpets can so it is a fantastic flooring product for families with young children, families with pets and people who are busy. It is also very easy to clean stains, although stains rarely have a chance to make an appearance on this type of flooring. 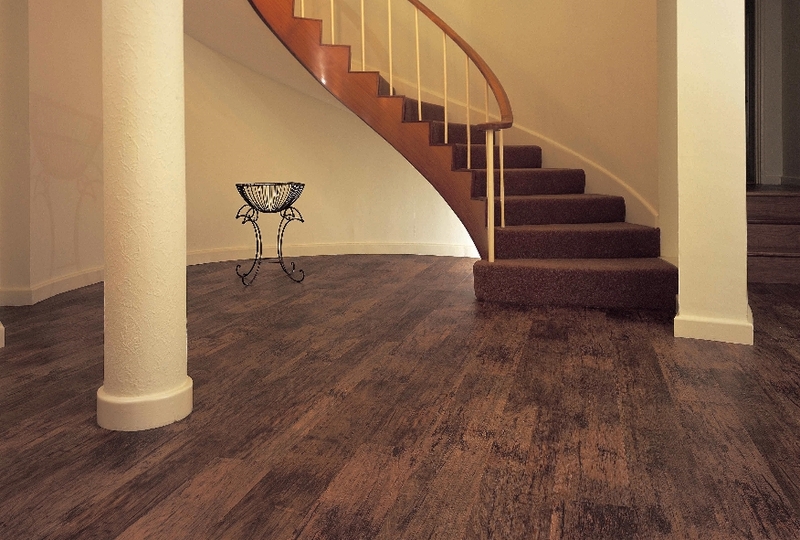 At Burgess Flooring we can fit laminate flooring in your home with ease. We have worked with laminate for years and can very quickly install the underlay and the laminate for you. We are conscious of the fact that relaying flooring is very disruptive so we always aim to be quick yet provide an excellent finish and we always clear up after ourselves. Many people ask us what engineered wood is as it is not a term widely used. However, it is a product which is widely used! Engineered wood is real wood which is pressed into more than one layer so it is more solid and dense. It can be two layers pressed together, or even more layers. It is even more strong and stable because the layers run in different directions to one another. The layers are pressed into planks and it is only the surface of the plank which is seen but the real work goes on within the depth of the plank. One of the major bonuses of engineered wood is that it is almost always more cost effective than real wood flooring and is quicker to install because of its uniformity. This product is also very strong and durable because of the compression of layers. It can be nailed directly into joists without the need for sub-flooring and works in basement areas and on concrete. We have all the need-to-know knowledge on engineered wood, can advise our clients on the type of finish available, explain the process of manufacture in more detail and can recommend suppliers and products to our customers. Real wood flooring doesn’t need much of an explanation; it is simply planks of timber made from various woods and laid as flooring! Real wood flooring adds warmth, colour and texture to a home and is often seen as a very homely addition to a house.Homeowners can choose between hardwood flooring and softwood flooring. Hardwood flooring can be the likes of walnut, oak and maple. Softwood flooring is your pines and Cedars for instance. As the names suggest, hardwood flooring is more durable and stronger than their softwood counterparts. A pro for solid wood floors are the fact that they have a thicker, or deeper, wear surface than other wooden floors. Therefore, despite the fact it is generally more expensive than other types of flooring, real wooden floors last a long period of time. In fact, it is not uncommon for homes built centuries ago to still have their original wooden floors in place and in use today. We are proud to supply amongst others: Boen; Ted Todd; Havwoods and V4. Our customers delight at our prices, professionalism and first class fitting service. We are very competitive, not only with our prices but also with the quality of work we produce, whether this is with our blind fitting, carpeting, flooring or our artificial grass service. Just click on the links to find out more about our skills and what additional products we offer our Sussex wood flooring clients.